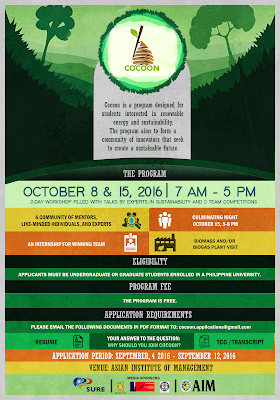 This October 2016, Solutions Using Renewable Energy Inc. (SURE) will be launching Cocoon, a program for 20 college students interested in sustainability and renewable energy. Cocoon hopes to empower students who seek to provide sustainable solutions but are barred by the lack of a community and of a greater understanding of the industry. Cocoon will kick off on October 8 with the first day of the workshop. The workshop is divided into talks on renewable energy and sustainability and team competitions. The winning team at the end of the 2-day workshop will be awarded with an internship with partner companies. The workshop will be held in Asian Institute of Management. Details of the application requirements can be found in the poster below. The application period will run from September 3-18, 2016. For any inquiries, you may contact SURE through their Facebook page (https://www.facebook.com/sureincph/) or email cocoon.applications@gmail.com.